A dispute has arisen between the Panama Canal Authority and he contracting consortium over US$ 1.6 billion in cost overruns. Amec has made a US$ 3.2 billion cash and shares offer to acquire Foster Wheeler. President of Chinese construction equipment manufacturer Liugong doesn’t hold back in one of the latest additions to the Video Zone. This year’s International Construction Economic Forum will take place in London with a full, but more streamlined programme. Growth support policies are helping to drive the Chinese construction sector, but care will be needed not to repeat the mistakes of the past. The coming years in China are expected to be characterised by a slowdown in demand and a change in strategy when it comes to construction. March’s ConExpo-Con/Agg exhibition is expected to welcome some 130,000 visitors, and the Las Vegas show will see the launch of plenty of new machines. 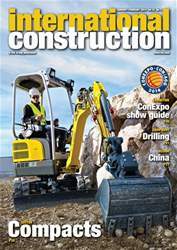 New emission laws have prompted a rush of new compact equipment launches, particularly skid steer and compact tracked loaders. Better fuel efficiency, more powerful performance and new features are hall marks of these new machines. New technology and new applications are pushing the boundaries in the drilling sector. A review of Intermat Middle East along with CEO interviews with Matti Kähkönen of Metso and Björn Ingemanson of Volvo Penta.